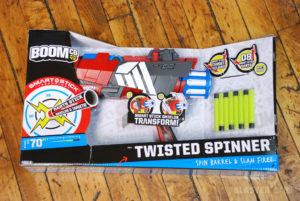 Along with the Farshot and Rapid Madness, the Twisted Spinner is one of the first in a new line of blasters to be introduced by Mattel under the BOOMco brand. We were impressed by the build quality and ingenuity of the Farshot with its then-new “Smart Stick” dart technology, and we were likewise awed by the insanely quick rate-of-fire produced by the intimidating-looking Rapid Madness. The Twisted Spinner, for its part, sits between these two products in terms of size and price. We were interested, therefore, to see if it could straddle the line between the two in terms of performance and value. What we found surprised even us. As with the rest of the BOOMco product line, we were suitably impressed by the Twisted Spinner’s packaging design and presentation, if not by how long it actually takes to remove it from said encasement, with all of its tie-downs, tape, and cardboard. 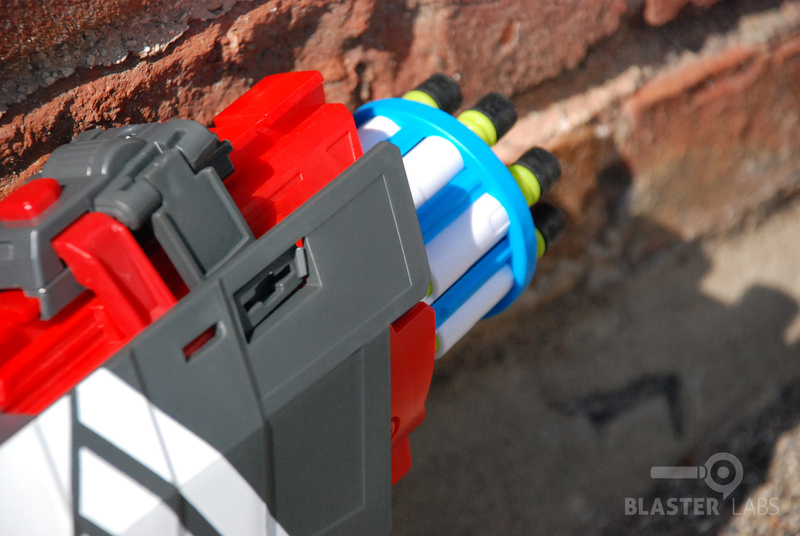 But once out of the box, you are presented with a mid-weight blaster that has a front-loading barrel and double-grip design, 8 Smart Stick darts, a removable and “transforming” blaster shield, a 9.25″ Smart Stick target, and a set of basic instructions. Aesthetically and ergonomically, the Twisted Spinner’s fore and aft handles look a little small for the size of the body and barrel, and indeed they are… much like the Farshot, these are bordering on being child-sized grips. And they don’t hold any spare darts like the Farshot does. Nonetheless, they are well-formed and solid-feeling. 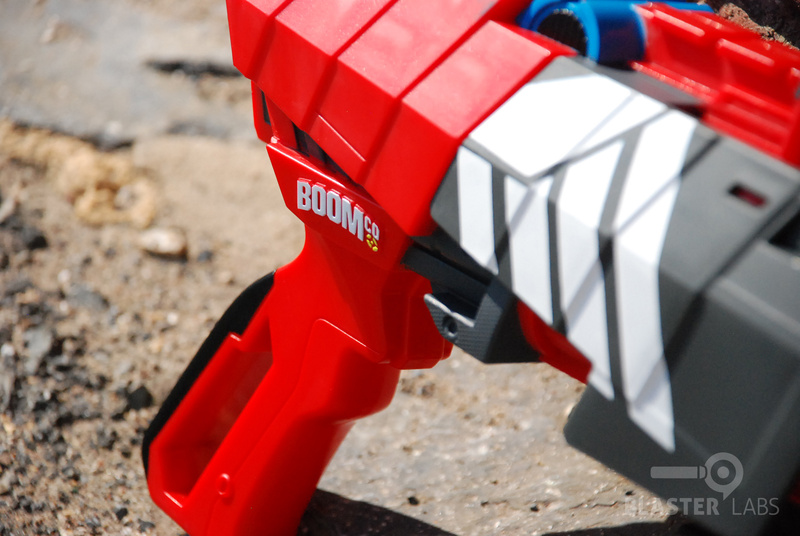 Indeed, the overall blaster feels reasonably solid, and it uses the same quality plastics we’ve encountered in the rest of the BOOMco line-up. The pop-up shield is a flimsy and finicky, like other BOOMco blasters, but you can always remove that or just ignore it. 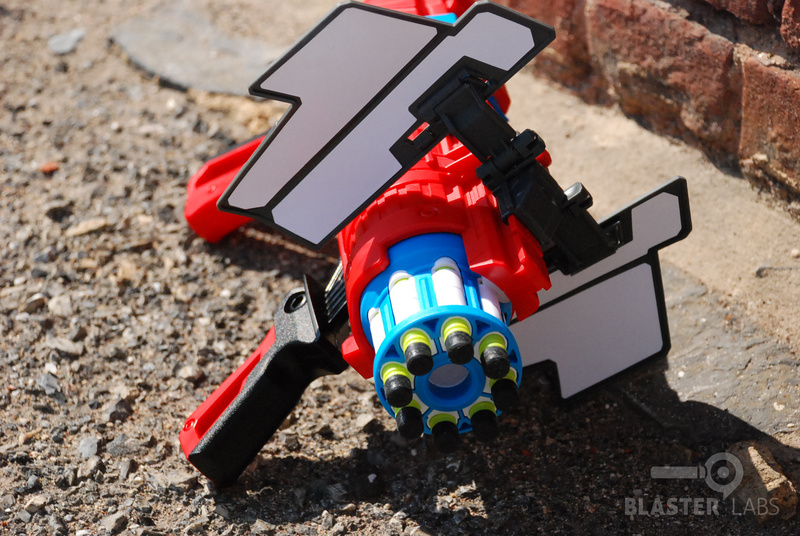 Still, the overall look of the Twisted Spinner is a little unbalanced, particularly with the Jurassic Park-esque blaster shield in-place, though the circular array of up to 8 darts in the barrel does create a Gatling gun feel that we can get behind. We began our official analysis of the Twisted Spinner with our usual array of test procedures, including maximum shot distance, dart velocity, accuracy, and rate-of-fire. In the distance test, we managed a maximum of 60 feet with one Twisted Spinner, and 63 feet with another (more on why we had two units in for testing, in a moment). This was more than a few feet shy of the 70 feet claimed on the box, but no worse than the Farshot we also tested recently, and on-par with most Nerf Elite blasters we see. So, this was reasonable, but nothing exceptional. Similarly, at an average speed of 58 feet-per-second, dart velocity was acceptable, but nothing to write home about. 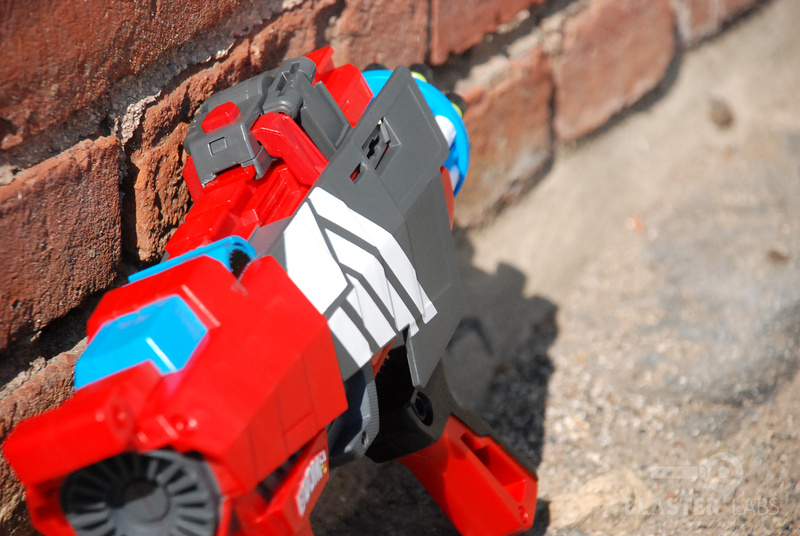 When it came to accuracy, we ran into our first significant issue with the Twisted Spinner. 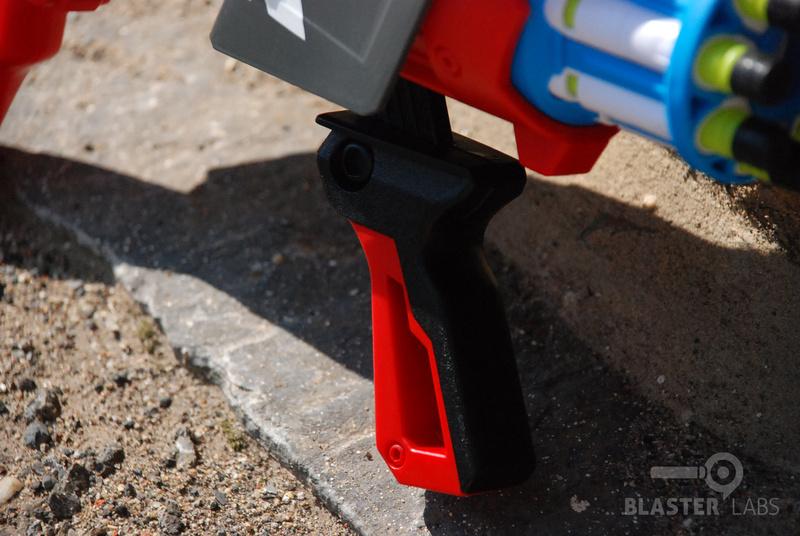 By virtue of the fact that there is no trigger, and firing requires the user to pull back on the front-mounted handle to simultaneously prime and fire a dart, the blaster is always being pulled in one direction or another while firing. We found that we would typically pull upward, but really, it’s possible that users will be pulling in all different directions, resulting in accuracy that is incredibly poor, barring absolute concentration and a perfectly still pull of the front handle (which is essentially impossible). 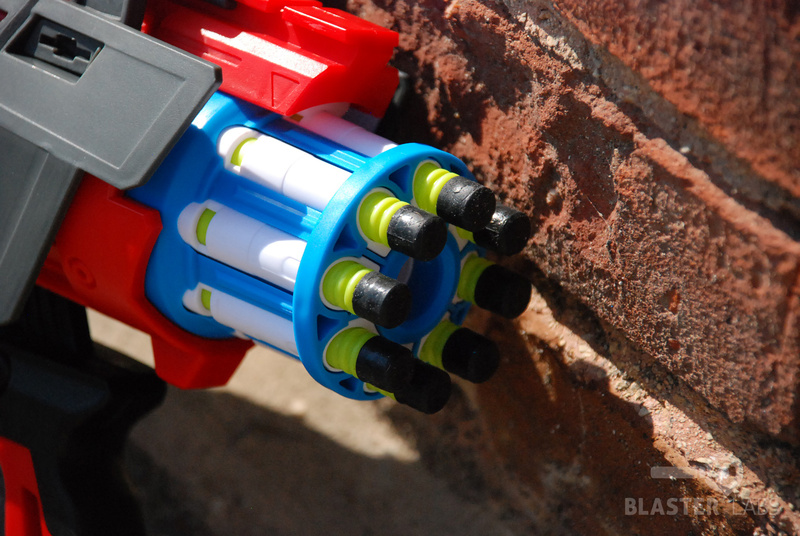 As with all BOOMco blasters, there is an inherent accuracy advantage in the use of the plastic Smart Stick darts (which don’t bob-and-weave like foam darts), so it does have that going for it. But user error will almost always trump dart design with this blaster, resulting in sometimes unintentionally hilarious shots. But accuracy issues aside, our real problem came during our first rate-of-fire test. Here, we attempt to unload the blaster’s stock dart capacity as quickly as possible (measured in tenths of a second), which then provides us with a rate-of-fire figure. Naturally, we do this test several times in order to obtain the best results possible. But during just our 3rd or 4th test, something inside the Twisted Spinner stopped functioning, and the blaster became incapable of firing. Now, truth be told, our first sample of the Twisted Spinner arrived in a box that was badly damaged, so we assumed it was possible that we had simply gotten a damaged unit. Fortunately, Mattel’s PR firm was on-the-ball, and we had a brand-new Twisted Spinner overnighted and in our hands the very next day (thank you, Brittany–you rock!). So, with the new blaster in-hand, we set about re-doing our performance tests, which resulted in the slightly improved ranges noted above (3 additional feet), but unfortunately, the very same issue with rate-of-fire. While attempting to unload the Twisted Spinner in a brisk manner to obtain a maximum rate-of-fire (by a different member of our team, no less), our second review unit broke in the exact same way as the first! We haven’t take apart either of our review samples to identify the weak point, but it really doesn’t matter. As it stands right now, we have no choice by to advise that if a user were to attempt to fire the Twisted Spinner too aggressively, they will likely encounter the same point of failure. After having broken not one, but two Twisted Spinner samples in an attempt to obtain a measurement that every other blaster we’ve tested has been able to provide, we have a hard time feeling as though this product is designed or built to the same standard as most others. In fact, we have never–not once–had a product come through our lab with the same defect in two separate units. We don’t believe Mattel has gone cheap on materials quality as some other companies have done, nor do we believe the issue to be intentional. 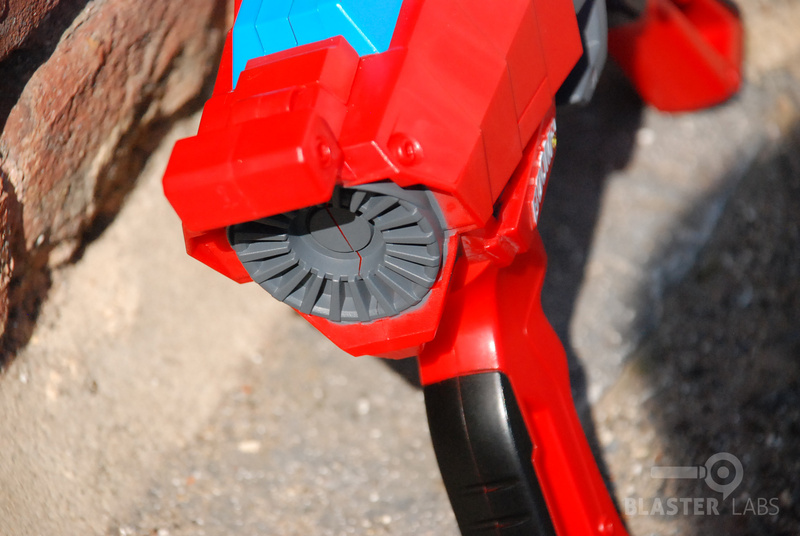 Rather, we believe there is an inherent design and engineering issue here, and as such, the blaster should come with a warning that it is not intended to be fired rapidly. But is the Twisted Spinner at least fun if you’re not trying to fire it quickly? Well, the barrel rotates after a shot, and that looks cool. But it doesn’t add any play value at all. 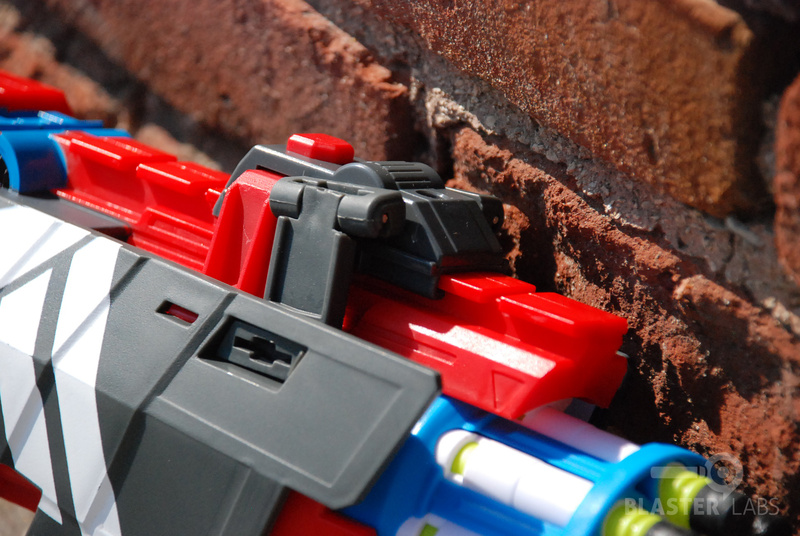 In addition, the firing sequence is a little loud, and the priming/firing handle requires a good pull to operate. And when you fire off shot after shot that doesn’t go where you intended, the magic is lost pretty quickly. 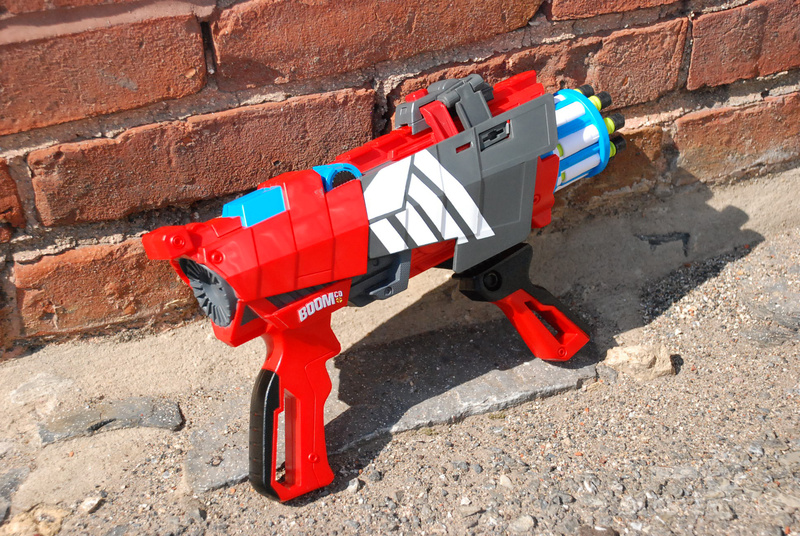 So, here we have a blaster that can’t be fired quickly, doesn’t quite live up to performance expectations, isn’t really sized well for adults, looks a bit goofy, and isn’t particularly inexpensive. It also doesn’t really have anything going for it in terms of value to the avid competitor, since it’s not very accurate and only holds 8 shots. But perhaps we’re missing the point. 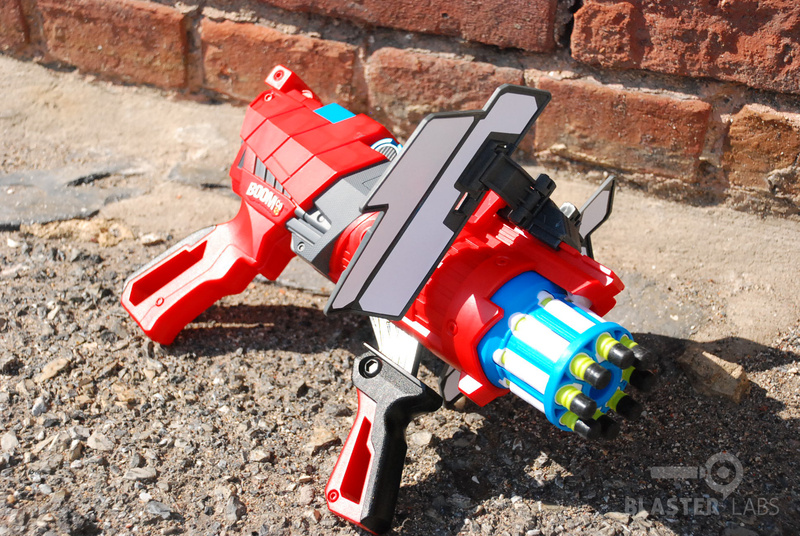 Perhaps this is simply a blaster geared toward children. And we would be ok with that, if it weren’t so difficult to fire, if the body were a little smaller and lighter, and if it were priced more appropriately as a semi-disposable toy. But unfortunately, it’s not. As such, and particularly with the issues noted during our testing, we don’t really feel it deserves to be held in the same company as other BOOMco products. And we definitely don’t feel it deserves our recommendation. 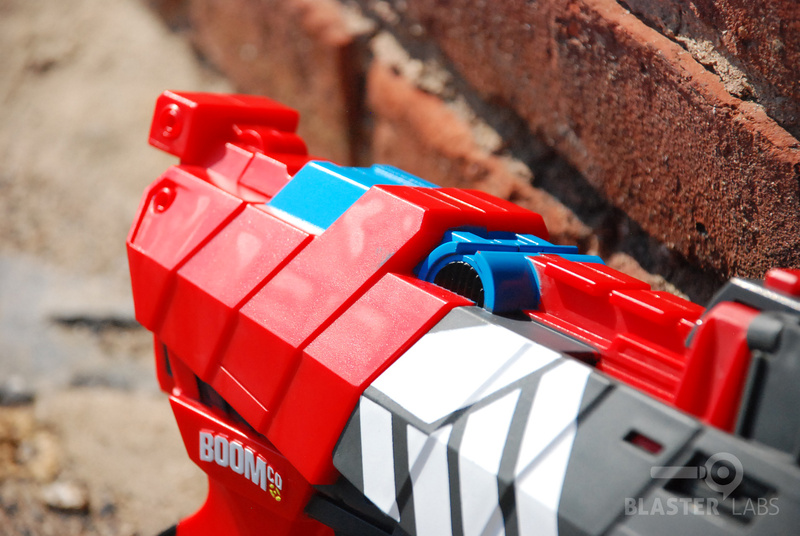 This entry was posted in Dart Blasters, Reviews and tagged boomco, review, Twisted Spinner on July 4, 2014 by PMindemann. True enough… you pull the front handle and instantly you’ve altered your trajectory. That’s an inherent design flaw that is tough to overlook. It’s a shame, because this brand needs a good, mid-priced blaster in its line-up. I actually found this to be one of my favourite gun for head-shots after practicing more with it. Like all other guns, the key to aiming well is to develop an ability to use your senses to estimate and position where the gun will and should be at the point of firing and where the bullet will land base on the previous shot(s) fired. To gain the most advantage you might be moving and dodging shots at the same time no matter what gun you use. You get a series of eight shots, from a fully loaded gun, plus your past experience in using the gun to fine tune your shots. Firing it at the fastest possible rate is not a good idea when you are also adjusting its aim. One of my friend do have a habit of doing as rapid firing as he can with this gun, fortunately he haven’t broke it yet. Hey! I have a quistion : Can you use normal nerf darts with the BOOMco blasters? Thanks for replying, love the reviews! Thanks for the kind words. 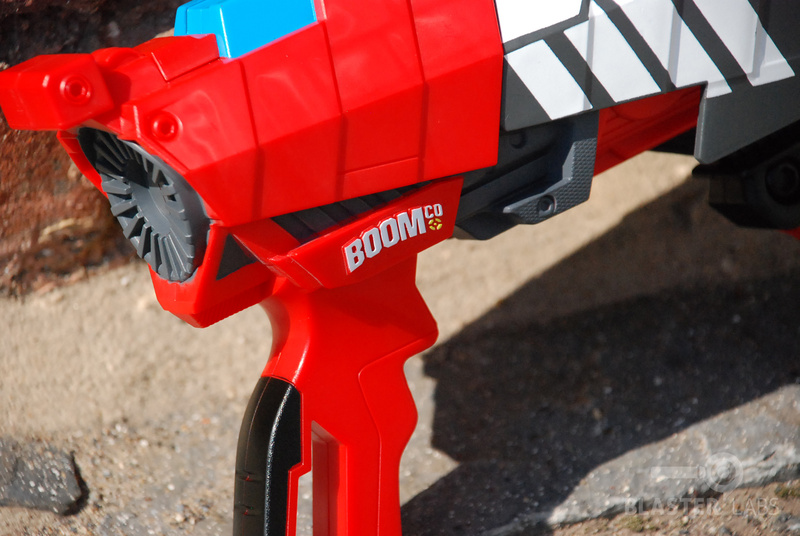 To answer your question, BOOMco uses totally different dart types… no cross-compatibility at all with Nerf, unfortunately. At my country Malaysia this gun price very HIGH!!! TOY R US and Jusco Aeon sell RM109.90!!! Can someone explain to me please? Is it the currency problem or transportation fee or other special problem? Actually that price is equivalent to $30 U.S. dollars, so its only $5 dollars more, or about a difference of RM18. I got this as a gift for Christmas. After a while you can actually get a little better accuracy when your used to it. However I admit when I first shot it I was trying to shoot straight and instead i shot at like a 50 degree angle XD! As for the issue of it breaking nothing like that has happened to me. I can fire at around 1.5 through 2 darts per second with no issues, but now I’m afraid to try more. it. Whipblast used to be a favourite of mine but Farshot has taken its place.